When I started playing Scrabble, I mistakenly thought it was a game about spelling and vocabulary. I never did very well, because I was more concerned with spelling fancy words than positioning my tiles effectively. But then I had an epiphany: Scrabble wasn’t really about spelling; it was about strategic arrangement. Being good at spelling helped, but it wasn’t the most important aspect of the game. This is not a post about how I began using the words “qi” and “za” in all my short stories, but rather, a reflection on how I started applying Scrabble principles to my own writing. Through Scrabble, I learned that if you want to win, your words have to do more than one thing. If you play all perpendicular words, you probably won’t score very well. But if you look for opportunities to spell words parallel to other words, you can spell (and collect points for) your long word and all the other two-letter words you spelled in the process. If you can find a way to do that and get a double or triple word score tile, that’s even better! It took me awhile to memorize all the two-letter words before I got the hang of this, but once I did, making my words do more than one thing became much easier. It’s the same thing in writing. In Jerry Cleaver’s Immediate Fiction, he refers to “setting scene, revealing character, [and] moving plot” as doing “triple duty,” and says that every single scene in your story should be doing those three things. If they aren’t, then it’s time to fix it. When I began applying this “triple duty” principle to my work, I realized that it took a lot of hard work and practice to get the hang of it– just like memorizing all those two-letter words. It was challenging, but it also made my stories a lot more successful. I learned to think in anagrams. In Scrabble, you can get bingo by playing a 7-letter word and using all of your tiles. By getting bingo, you score 50 extra points. At first, finding anagrams is very difficult. Some people can do it in their heads really well, but I’m better at it when I actually move my tiles around on my rack. Sometimes, those rearrangements helps me see something I didn’t notice before. When I’m writing, sometimes I get caught up in being a little too chronologically accurate, and I lose sight of how I could rearrange my story. After playing Scrabble for awhile, I got the idea to start cutting up my stories into scenes with scissors. I spread my scenes out on my floor, then rearranged them. I put the first scene last and the last scene first; I mixed up the middle parts until it didn’t make sense. When I read it out of order, it helped me see things differently. I realized that there were some scenes I didn’t need and other scenes I could use more effectively; there were characters and settings I could do more with. Pre-Scrabble, I would have been hesitant to tear my own story apart like that. Now, I feel more comfortable shifting things around, because I know that it oftentimes helps me recognize new opportunities– and best of all, if it doesn’t, I can always put it back in its original order. I learned that practice makes perfect. 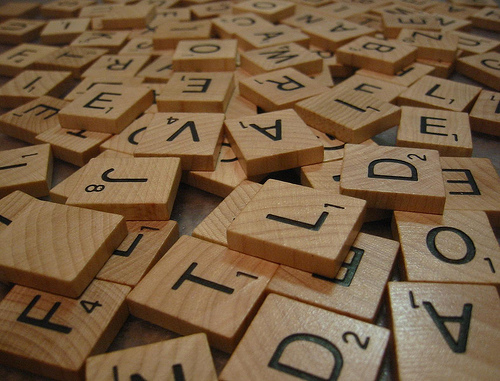 If you play enough games of Scrabble, you know that the people who are most likely to win aren’t the English majors or ones with the brilliant vocabularies; they are the ones who have played the most Scrabble games. I’m definitely not a Scrabble master. But from my limited experience, I noticed that I only started winning at Scrabble games after playing hundreds of rounds, reading Scrabble blogs with religious devotion, and memorizing all the two-letter words. A lot of people would probably laugh if they knew how much time I had put into this board game– but to me, it was a challenge, and it was thoroughly satisfying to put my new knowledge to work. I’m learning so much from this blog. I never realized this before! Thank you for putting into words what I’ve known subconsciously this whole time.